I'm tempted on a daily basis to buy a spiralizer when beautiful coils of perfect courgette spaghetti fill my Instagram and Facebook newsfeeds, I lust after a spiralizer of my own to recreate pasta free spiralized courgette vongole. 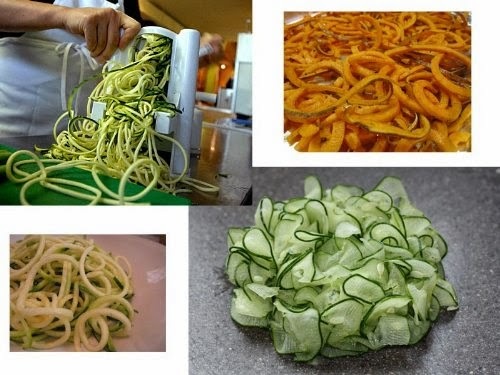 Plus, just think of the other uses for a spiralizer like cucumber spirals and erm... more courgette spaghetti. Spiralite Vegetable Spiralizer by Spiralz is £29.95. Perfectly priced for an impulse buy gadget. Expensive enough for you to vow to use it everyday but not so pricey that you'll miss it when it inevitably ends up gathering dust at the back of that junk filled kitchen cupboard where must have kitchen gadgets go to die. Those gadgets that you loved for 5 minutes but then realised they are a pain to clean or too fiddly to use. Empanada maker, pasta machine, and chip dicer I'm looking at you. Despite knowing a spiralizer would probably end up in the junk cupboard I'm still tempted, I blame Pinterest for brainwashing me into thinking my life quality would improve and my family would love me more if I served spiralised vegetables. Wouldn't they? Moments away from checking out with the spiralizer that is already in my Amazon basket and I give myself a shake. I do not need this, I'll write a blog post about how much I do not need this and why I won't be suckered in again and then I'll probably forget all that logic and buy it anyway. Waste what happens to all the non spiralised bits? How many dishes use spiralised vegetables? Ok it's pretty but is there really any need for spiralised vegetables? What kitchen gadget did you think you couldn't live without but now rarely use?